From 3 to 27 May 2011 the FIDE Candidates Matches take place in Kazan, Russia. The winner will qualify to challenge the World Champion GM Vishy Anand in a 12-game match during the first half of 2012. Time control:120 minutes for the first 40 moves, then 60 minutes for the next 20 moves and then 15 minutes for the rest of the game plus an additional 30 seconds increment per move, starting from move 61. Tiebreaks: four games of 25 minutes plus 10 seconds increment, two blitz games (five minutes plus three seconds) and one sudden death game (five against four, with three seconds increment from move 61, and draw odds for Black). Colin McGourty’s translations first appear (most days) in real time at the special “live games” page of his site “Chess in Translation” and then, after some editing, can be found at their permanent locations. The Tata Steel Chess Tournament (known before as Corus Chess Tournament) takes place in Wijk aan Zee, Netherlands. 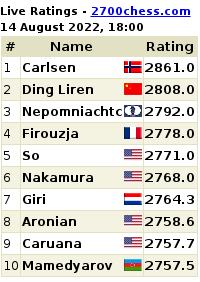 The three Grandmaster tournaments have 14 players each. Format: single round-robin of 13 rounds. Time control: 100 minutes for 40 moves, followed by 50 minutes for 20 moves, then 15 minutes for the remaining moves with 30 seconds cumulative increment for each move starting from the first move. Playing days: 15-18, 20-23, 25-26 and 28-30 January 2011. Games begin: 1:30 PM (12PM on 30 Jun) GMT+1 / 3:30 PM (2 PM on 30 Jun) Moscow time. Colin McGourty’s translations first appear in real time at the special “live games” page of his site “Chess in Translation” and then, after some editing, can be found at their permanent locations. The 2nd London Chess Classic takes place in the Olympia Conference Center, Kensington, London, UK. The event is Category 20. Participants: Viswanathan Anand (2804), Magnus Carlsen (2802), Vladimir Kramnik (2791), Hikaru Nakamura (2741), Michael Adams(2723), Nigel Short (2680), Luke McShane (2645) and David Howell (2611). Prize fund: 145,000 Euros. Six main prizes: 1st 50,000 Euros, 2nd 25,000 Euros, 3rd 15,000 Euros, 4th 10,000 Euros, 5th 10,000 Euros, 6th 8,000 Euros. Plus 7 Daily Best Game prizes of 1,000 Euros (voted on by the public) and a winners’ pool of 20,000 Euros for each game won. Format: single round-robin of seven rounds. Score system: 3 points for a win, 1 point for a draw. Time control: 40 moves in 2 hours, then 20 moves in 1 hour and then 15 minutes to finish the game with 30 seconds increment from move 61. Sofia Rules. Playing days: 7-12 and 14-15 December. Games begin: 2:00 PM (4.00 PM on 9 Dec, 12PM on 15 Dec) GMT / 5:00 PM (7 PM on 9 Dec, 3 PM on 15 Dec) Moscow time. KC-Conference with Ruslan Ponomariov: ask him in English! Once again, as part of the Crestbook KC-Conference project, you have the chance to ask a super-grandmaster absolutely anything you want. Now it's Ruslan Ponomariov, the youngest World Champion in history (in a FIDE knockout, it’s true, but beating Morozevich, Bareev, Svidler and Ivanchuk along the way!). Nevertheless, he’s still perhaps one of the lesser-known super-grandmasters, so this is a chance to put things right. Your questions for GM Ruslan Ponomariov can be submitted in English at a special post at Chess in Translation site. Of course, it is also possible to submit your questions in Russian at KasparovChess forum. KC-Conference with Peter Svidler: ask him in English! Peter Svidler, one of the most likeable and colourful members of the chess elite, is ready to answer chess fans questions as part of the Crestbook KC-Conference project. Until now it was only possible to pose questions in Russian. Not anymore! You can now ask the five-time Russian Champion about virtually anything in English as a special thread "Your questions for GM Peter Svidler" is open at Chess in Translation. Of course, it is also possible to submit your questions in Russian at KasparovChess forum. The deadline is 10 November.